First of all, I want to say thank you for all of the encouragement I’ve received for my upcoming trip to the World Championship. The reaction to my announcement was overwhelming, and reminded me of how lucky I am to have such supportive friends and family. Many of you have asked me how you can help in getting me to New Zealand. 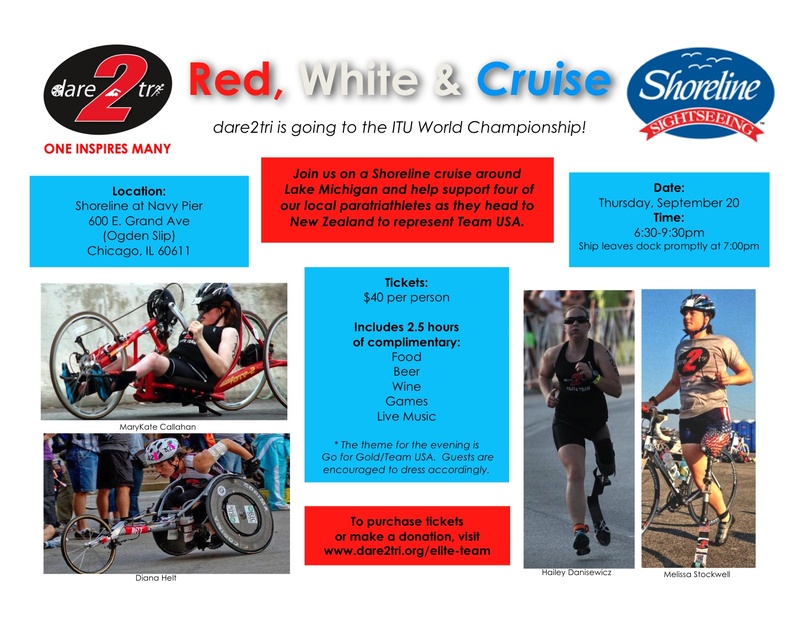 My best answer is to consider coming to the fundraiser dare2tri is hosting to benefit the Worlds Team called “Red, White & Cruise.” The event is on Thursday, September 20 from 6:30-9:30 and includes an evening cruise on Lake Michigan. Shoreline Sightseeing has generously donated the boat (and alcohol!) at no cost to us, meaning we will profit 100% of the ticket price! I don’t want to reveal all of the fun, but I can say that there will be live music, dancing, a scavenger hunt, socket drinking, and a really cute dog dressed in patriotic attire. And it’s all happening on a boat, with an amazing view of the world’s greatest city. Seriously, how could this not be fun? For more details, see the invitation at the bottom of this post. If you aren’t able to make the event on the 20th but would still like to contribute, you can visit my fundraising page at: http://www.imathlete.com/donate/HaileyDanisewicz. There you can make an online tax deductible donation that will go directly to our Worlds fund. Thanks again for your words of support. I hope to see many of you on September 20!